Whenever we travel to Florida for vacation, one of the most sought after desserts for our family is to split a slice of key lime pie. Then at each restaurant we visit, we will get a slice of pie...split it...then at the end of the trip we will decide which slice of pie we liked the best. Not too long ago, our family each brought one of our favorite dishes. Our daughters love to cook and are always watching different cooking videos, reading different magazines and cookbooks, glancing through Instagram for different ideas to bake, make and create. So the girls decided they wanted to make key lime cheesecake. It threw me for a minute because they said cheesecake rather than pie...but my oh my this recipe was very good. Below please find one of our family favorites! Make your favorite graham cracker crust in a springform pan. In a large mixer bowl, add cream cheese and 3/4 cup sugar until smooth, beat in the eggs, one at a time, beating well after each addition. Add the sour cream, flour, key lime juice and vanilla. Mix the batter until it is smooth and no lumps. Pour the filling over the crust. Bake the cheesecake in the preheated oven for 15 minutes, reduce the temperature to 250 degrees F (120 degrees C) and bake for 50 - 55 minutes longer, or until center is barely set. Let the cheesecake cool on a rack, then chill, overnight. 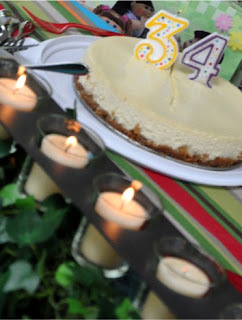 Remove the cheesecake from the pan and transfer it to a cake stand. You can add a thin slice of lime and whip cream to the top of each cheesecake slice, or even sliced mango.